No matter your floor plan, this Nexera TV stand will fit right in. Easily accommodate 51-inch to 60-inch televisions with the black free standing TV stand. This TV stand is great for storing movies, gaming consoles, and speakers. Achieving the perfect desktop setup is about striking a balance between style and functionality. The DMS1000 is designed to do exactly that. Combining industrial influences with a minimalist design, this gas shock monitor mount allows for finger-tip adjustments to be made to the height and orientation of your screen. Raise, tilt, swivel and rotate your monitor on the fly to ensure it's always in an ideal position. The detachable base provides a seamless connection to your desk, while its easy-to-use clamping mechanism can be secured to any ledge or grommet hole up to 2 inch thick. To ensure a clutter-free setup, the DMS1000 also includes cable management clips to conveniently route your cables. Radar Collection from Nexera is a trendy and easy to live entertainment collection offered in a rich walnut and charcoal finish. Radar Audio Cabinet from Nexera features 1 storage drawer and 3 open spaces for your electronic components; the cabinet also features a removable back panel to facilitate wire management and optimize air flow. 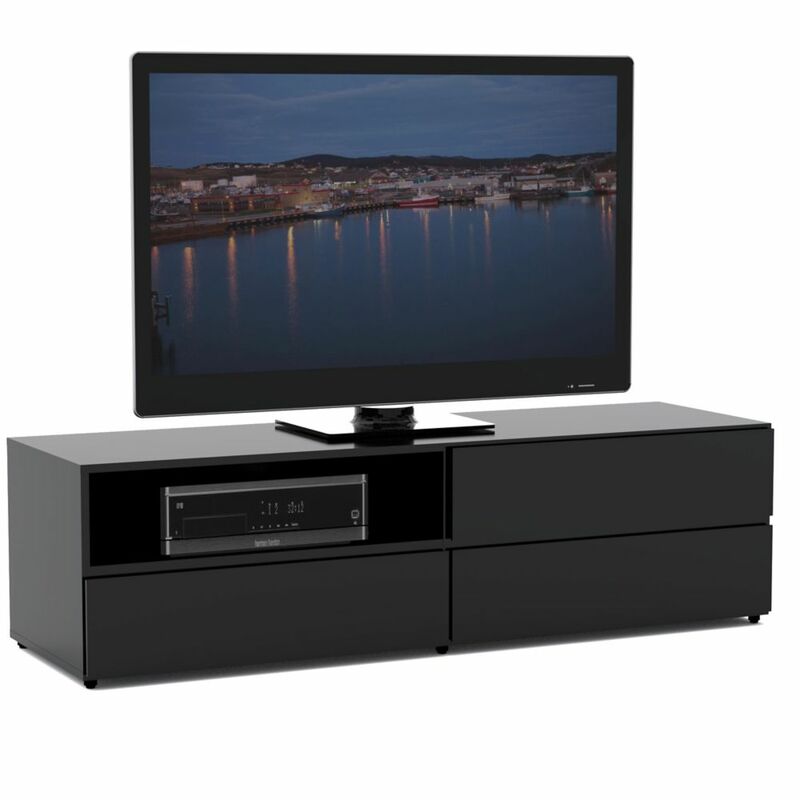 The Radar Audio Cabinet can be paired with matching Radar TV Stand for a complete home entertainment set. Avenue 59.75-inch x 16.75-inch x 18.75-inch TV Stand in Black No matter your floor plan, this Nexera TV stand will fit right in. Easily accommodate 51-inch to 60-inch televisions with the black free standing TV stand. This TV stand is great for storing movies, gaming consoles, and speakers. Avenue 59.75-inch x 16.75-inch x 18.75-inch TV Stand in Black is rated 3.7 out of 5 by 3. Rated 1 out of 5 by Luc C from Poor or No QA - Front top panel is unfinished Assembled the stand witjput a problem until it cam time to install the top of the unit. The top piece front has not laminate (but the back does).... Poor or no quality control. Now I must wait to contact support to get a replacement top (if I can). Wonder If I am an isolated case! Rated 5 out of 5 by Hannah from Good storage Good looking and huge storage, there are 3 drawers. Rated 5 out of 5 by sfly from Lots of storage room We bought this to fit under a window in our home office. It was easy assemble and looks great. A nice sleek piece of furniture with lots of storage. And the price was excellent.